Ingelia Italia S.p.a. announces the development of a commercial Hydrothermal Carbonization in Tuscany, Italy, which will process 80,000 tn/y of civil sewage sludge. The plant, developed and designed by Ingelia for ACEA, will be the largest designed so far, and it will transform sewage sludge in two high value products: a biolignite, and a biofertilizer, obtained by extracting all valuable elements from the sludge. Depurated water available for industrial use or irrigation will be the byproduct of this plant. This plant represents an additional step, done by Ingelia, in the industrial development o f its advanced Hydrothermal Carbonization technology, as it will be integrated with a phosphates extraction systems, ensuring maximum phosphorus recovery. At present, a 13 000 t/y capacity plant is operating in Naquera (Valencia), Spain – see photo. And a second plant, with a capacity of 6,000 tn/year, owned by the University of Nottingham and operated by CPL is processing food and green waste at CPL Industries’ Immingham site, in UK. The plant in UK is expected to be enlarged in the next years. A third HTC project is under development in Oostende, Belgium. 4 HTC reactors will be installed to recover biolignite from residual organic waste of Renasci Waste treatment plant. The plant developed by Renasci will treat unseparated municipal solid waste, integrating advanced materials sorting technologies, fermentation unit to produce liquid fuels, and an HTC section which will process the residual organic solid material to produce biocoal. The project of Ingelia Italia S.p.a., developed by Ingelia for major Italian water service company ACEA, in Chiusi, Tuscany, is currently under evaluation at the Tuscany Region, waiting for final authorization. According to the timeline, the plant aims to be operational in 2020 and will treat 80.000 t/y of digested a non-digested sewage sludge (approx. 80% water content). The advanced process steps included in this project are represented not only by the main step of Hydrothermal Carbonisation, but also by innovative technologies for inerts removal, phosphorus leaching, and biocoal refining. A biofertilizer, obtained from the leaching of Phosphorus and Calcium, mixed with other nutrients extracted from process water: Nitrogen, Potassium. The production of two high quality products, makes the plant a no-waste biorefinery, where all elements contained in the sludge are recovered, with maximum environmental safety. The plant HTC process operates at around 200°C, 16-20 bars, for 4-6 hours, with low energy consumption. The biocoal will have reduced ash content, and high carbon concentration (> 60% on dry ash free basis). The biofertilizer will contain high concentration of phosphates, Calcium and nitrogen, but also Potassium and other elements of high value for sustainable agriculture. 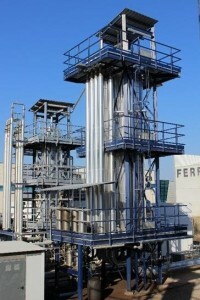 New plants are under development by Ingelia in Spain, France, and Italy. In particular, another project has been presented by Ingelia Italia for processing 60,000 t/y of domestic organic waste in Tuscany, and new projects are under negotiation in different Italian regions. Considering the market opportunity and the economic reliability of this solution, a technological transition is coming in organic waste sector.